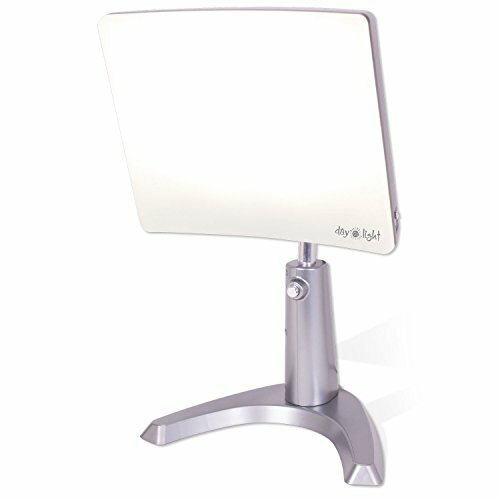 Day-Light Classic Plus provides the maximum recommended 10,000 LUX of glare-free white light; customizable, safe, and glare-free diffusion screen, it includes flicker-free bulbs and an adjustable stand, allowing for a flexible angle for optimal results. The Mayo Clinic suggests using light therapy. Carex Health Brands brings you a tool that safely and comfortably blocks 99.3% of UV and projects light downward as recommended by health experts for maximum comfort and ease of use. Carex Health Brands created a superior, long lasting, angle and height adjustable product based on the model used by researchers around the world; includes 2 light settings to further customize your theraputic treatment; limited warranty included. Relieve the symptoms of shift adjustment, jet lag, circadian sleep disorders, Winter Blues, and low energy by using the Carex Health Brands Day-Light Classic Plus while exercising, as a tool to energize you in the mornings, or while you work.